Doing the first demo of the day for Kindergradens. This was a fun demo. 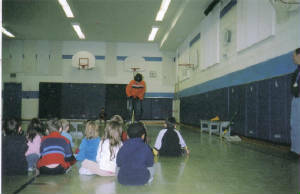 I did a seaprite show for everygrade in my school thats up to Kingarten to Grade Eight. They were each an average of Seven Minuets. I ask my vice princible of my school before I was a trouble maker if I could do a pogo show for the school and he said yes but we have to run it bythe princible. She also agreed. But she said I couldnt do them at the same time because of the different work peroids. I got to pogo in my schools gym and halls and not be in any what so ever trouble! It was awesome. People used to dis courage me for pogo sticking because they though it was stupied and pointless but after I showed them they were amazed.